Due to cloudy skies, the annual Messier Marathon has been cancelled. We apologize for any inconvenience. The constellations in the background show the sky around the constellation of Cassiopeia which is abbreviated as “CAS”. The round logo represents looking through an eyepiece through a telescope and focusing on the State of Ohio. The bottom of the state outline represents the dark foreground of trees and hills like what we see in the Hocking Hills. Our club has a long standing relationship with the Hocking Hills State Park. 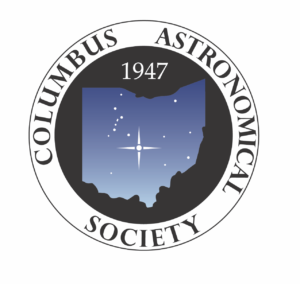 The “star” in the middle represents Columbus, OH, our home. It also is the location, in reference to the background constellations, of the strong radio source of Cassiopeia A. 1947 is the year of our founding. And finally, the gradient color of the state represents the twilight sky: the transition between night and day.